Spend Christmas in Scotland with this special collection. This set includes A Conall Christmas, A McMillan Christmas, and Morna's Magic & Mistletoe. These books were previously published as individual titles. Adelle, a former socialite and serial dater, finds that her current age seems much older in the 17th century than it did in the 21st. She resigns herself to the fact that she will remain single for the rest of her days - at least until an unexpected visitor arrives at the castle. Hew has spent the last 20 years all alone. When a winter storm causes him to seek shelter, he meets the first lass since his beloved Mae to make his heart flutter once again. Will he be able to release himself from his grief to allow another love into his life? When the worst Christmas snowstorm of the century hits the Scottish Highlands, Harper knows she must seek shelter and is left with no choice but to take refuge in the one place she swore to never return - McMillan Castle - the home of the only man to ever break her heart. Christmas only reminds Kamden of all he's lost. As he settles in for yet another holiday spent alone, he is stunned when his ex-girlfriend breaks into his home to escape the snow. Just as they begin to get reacquainted, Morna's meddling magic sends them back in time, and both are forced to reconsider what they thought they knew about the other. Kenna accompanies Cooper hundreds of years into the future for a week of Christmas celebrations with the old witch, Morna, but unexpected guests upend all of their holiday plans. When Malcolm bumps into old friends, he meets the first woman in years to stir something long neglected inside his heart. Time together ignites their passion for one another, but the undeniable truth that they live worlds apart threatens their bond. Will their new love for one another be enough to convince him to leave the life he’s always known? LOVE LOVE LOVE! !! Fabulous! You will not regret this one! I'm so glad I saved it to enjoy during Christmas time!! I love books by Bethany Claire being able to hear them in a Scottish brogue just make them that much better. overall, stories were decent. ending of the stories seemed to taper off quickly. was personally not a fan of the first story narrator - barely got thru it without shutting it off. too breathless and dramatic with every single statement. Second story started off the same, though very quick, but got better. by the third story, the narrator was pretty good. 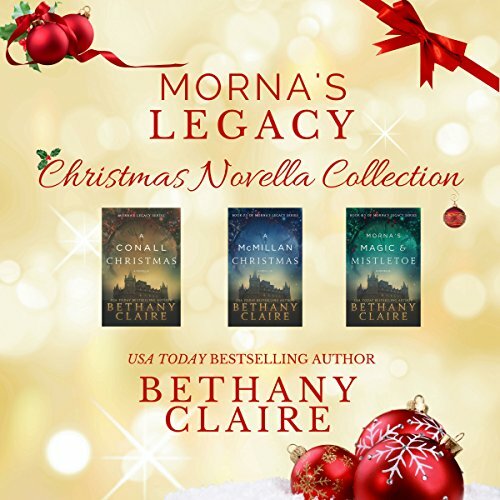 Where does Morna's Legacy Christmas Novella Collection: Scottish Time Travel Christmas Novellas rank among all the audiobooks you’ve listened to so far? I listened to this novella collection when I was sick in bed, and it was so comforting. The stories are charming, the narration is lovely (and I love to hear her pronounce the Scottish names), and I loved that it was three individual stories. Three times the fun! If you love Christmas romances, you will love this audiobook collection. Highly recommended!! I love these three stories and it’s a treat to have them bundled together. Stories of both new and old love around the most magical time of the year. A great compliment to Bethany Claire’s writing is how Lily Collingwood brings her characters to life. Even if you have not read the full stories in Bethany’s series don’t be afraid to give these a read. Although wonderful when read as part of the series all of her books stand well on their own. These are wonderful novellas that remind us no matter our age or life circumstances there is always room for love and if we are lucky enough to find it we should grab on with both hands! For fans of the series they also open a world of possibilities for future stores. I for one can’t wait to see what lies ahead for of one of the young members of the clan! A time travel love story in each. Although I have read each book, it was a joy to be driving and relax and listen. and Malcolm but a glimpse into s possible puppy love of Cooper. Audio books are a great book for traveling. Loved these Christmas novellas, it's hard to say which is my favorite. I loved that the older people (Adelle & Hew and Kenna & Malcolm) also are able to find the love of their lives. The narrator did a great job telling the stories, it was hard to put dow, I wanted to hear it all in one sitting! What do you get when you combine love, magic, humor and a great narrator? Yep! Fun. Total Fun. Total Spirit Lifting FUN! !